How to think about a world order in flux. We live in a post-Cold War era, but not much else is clear about today’s global order. According to the recently-retired Ambassador-at-Large in Singapore’s Foreign Ministry, Bilahari Kausikan, the fundamental problem of present-day international relations is not, however, a lack of clarity. In his 2017 collection of essays, Dealing with an Ambiguous World, Kausikan argues that a more serious challenge is rising over the horizon, “When the international structure lacks clear definition… we can only navigate with reference to our own assessments.” The problem is that our assessments are too often shaped by “mental frameworks” that limit our capacity to see reality clearly, and absent any clear and constraining global architecture, political players are therefore free to project their limited “mental frameworks” onto the global stage. This tendency becomes particularly problematic when it comes to the two pillars of present-day global politics, China and the United States. What makes Kausikan exceptional is the humility and tough-mindedness of his focus. He doesn’t aspire to solve the problem of global (dis)order. Instead, he takes the disorder as a fact, and he then asks: How can we deal with the situation? Hence the title of his book, Dealing with an Ambiguous World. The first step, Kausikan argues, is to recognize the special import of mental frameworks in our time. When there is a global order, as there was during the Cold War, a “clearly defined structure” constrains political thought and behavior. There was only so much room for maneuvering when you were compelled to choose sides: either an American-led order or a Soviet-led order. When there is no clearly-defined global order, however, mental frameworks that “outrun reality” are not constrained by outside forces. This is especially the case, “When major power relationships defy simple characterization and the major powers are themselves groping towards new accommodations with each other.” In such a situation, which is where we find ourselves in today, “We have no firm landmarks from which to take bearings.” Instead, the only landmarks are the signposts that one finds in one’s own mind. Kausikan thus concludes that the world is now at “greater risk” from the errors produced by limiting mental frameworks. This is particularly true of the China-U.S. relationship, a bond that is characterized by both economic interdependence and mutual suspicion. According to Kausikan, while we can say with confidence that the U.S.-China relationship will be one of the pillars of the “new global architecture,” the character of their bilateral relationship remains unclear. 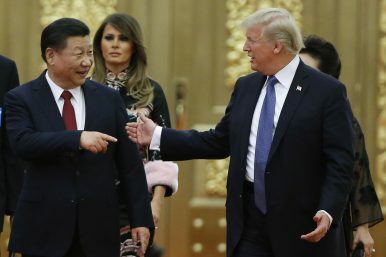 The U.S. and China are groping toward some kind of modus vivendi, testing each other’s limits and responses through a mixed bag of economic cooperation, pledges of good faith, trade wars (threatened and real) and military maneuvers. As the two countries muddle forward, the challenge is amplified by the existing mental frameworks of the Americans and the Chinese. How do the mental frameworks of the Americans and Chinese affect the present relationship between these two powers? “China’s rise,” writes Kausikan, “has been psychologically disquieting to many in the West because in China, capitalism flourishes without democracy.” The rise of China led by a communist party undermines the American belief in the universality of its political values. China’s rise challenges, in a very fundamental way, the American sense of self, and even American identity. The practical, political issue, however, is that while the Chinese consider the continued rule of the Chinese Communist Party to be a core interest, the Americans will find it very difficult, to say the least, to acknowledge the legitimacy of the communist party ruling in Beijing. But it is not just the Americans whose mental framework constrains their political behavior. “If a new modus vivendi requires the U.S. to acknowledge that different political systems can have their own legitimacy,” writes Kauskian, “it requires China to resist the temptations of triumphalist nationalism.” There is absolutely no precedent in China’s history for dealing with foreign states on the basis of equality, but that is exactly what the Chinese will have to do if they hope to integrate into the international arena without arousing resentment, never mind striking fear, throughout the world. It is no accident that Kausikan hails from the small state of Singapore, a country whose leaders facilitated Singapore’s relevance on the global stage, in part, by deeply understanding both the Confucian and Western mental frameworks. Mental agility is an asset in present-day international relations, and in the absence of a defined global order, recognizing the role that mental frameworks play in determining the behavior of various actors on the global stage is itself a powerful tool that grants a comparative advantage. Other countries would do well to follow Kausikan’s lead and cultivate a deep awareness of the mental frameworks of both the Americans and the Chinese. Ultimately, however, Kausikan’s book implicitly points beyond itself towards a new field of study that promises to be rich in insights, material, and practical utility. How so? If the problem of mental frameworks has become especially acute in today’s ambiguous global order, and that order will remain ambiguous for the foreseeable future, then the time is ripe for designing institutions and mechanisms, both local and multilateral, dedicated to shining a light on the problem. Needless to say, Dealing with an Ambiguous World will be essential reading in thinking about how to proceed. Aryeh Tepper is a Senior Research Fellow at SIGNAL, a China-Israel think tank based in Israel, and ISP Academic Advisor. China is here to stay, and Western and African countries alike should make the most of it.